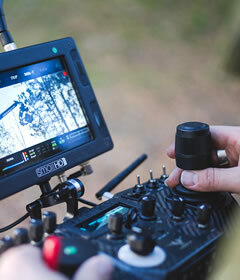 Recently, Freefly Systems announced it would be launching a new product called the MoVI XL. On the heels of the newly released MoVI Pro, a lot of people were wondering what the deal is with another iteration of the wildly successful MoVI gimbal stabilization system. Well here’s the deal – the MoVI XL is a BIG deal, as in it’s big, really big. Big enough in fact to carry a RED Helium (or whatever version they are on by the time you read this) or an Alexa Mini with pretty much any lens you can think of, including beasts such as the Angenieux 25-250mm, the Canon CN 30-300mm, or the Fujinon 25-300mm zoom lenses, complete with an industry standard Arri LMB-25 matte box and your favorite filters. You still have the freedom to add your favorite lens control system such as a Preston FIZ with all three motors, your wireless video transmitter, a cinetape horn, pretty much your entire dream cinema package with no compromises. And hold your hats – YES, it will also carry a full Alexa XT, the large format Alexa 65 camera, even the Phantom 4K no problem. Not only that, your standard Arri dovetail plate slides right onto the system as well, so going from studio mode on sticks to stabilized gimbal mode requires little or no prep – just pop the camera off one mount and pop it onto the other one. Simple. Since Motion State is all about utilizing the latest and greatest camera technologies in our projects, we had to get our hands on the MoVI XL and see for ourselves how it fulfilled all its lofty promises. So we joined up with the Freefly Systems team and headed out to Eastern Washington with a few truckloads of gear, including our new Dactylcam Pro motorized cable cam system, a twenty five foot Jimmy Jib, and several vehicles to mount the MoVI XL on such as the Polaris RZR ATV for off-road tests, an Audi SQ5 for speed tests, and a Lund speed boat for on-the-water tests. HOW WILL I EVER CARRY THIS BEAST? The short answer is you won’t. With the exception of mounting the MoVI XL on speed rail and having several grips carry it, the MoVI XL with a camera package will simply be too heavy for a person to carry it in any practical way. But this is not what the MoVI XL was designed for, it’s just important to clear that question up before we move on, as I know many of you are drooling over the thought of stabilizing your Alexa65 and running around with it. Our most extreme tests were by far our off-road tests, where we mounted the MoVI XL on a FlowCine Black Arm, attached it to a RZR ATV, and rallied through sand dunes and over extremely rocky dirt roads at high speed. Tabb Firchau, Freefly’s CEO aka “Chief Experimenting Officer”, was dead serious when he said he wanted to push the MoVI XL to its breaking point. Despite his very best efforts to decimate the system at high speed using Mad Max Fury Road driving tactics, the system and its precious cargo survived with nothing more than some mud splotches on its face (and ours!). Our primary test was to see how stable the footage was while hitting heavy bumps fast and furiously. As many of you MoVI users have discovered through use of the handheld versions, the wider the lens you use, the more stable the footage appears, as there is less image paralaxing effect for your eye to detect vertical or horizontal translation. This of course holds true for the MoVI XL as well, but by using the FlowCine Black Arm, a majority of this translation was removed. Even zoomed into 300 mm on our lens, the footage was incredibly smooth. It is important to note that these large zoom lenses do breathe considerably, i.e. 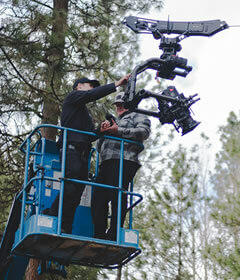 the weight shifts front or back as you zoom in or out, which puts the gimbal out of its ideal gravity neutral balance. 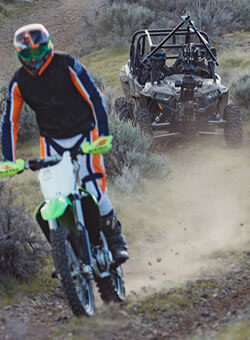 In order to get the very best performance, you would want to balance the gimbal for the lens length you plan to use the most and tune the Black Arm for the speed and terrain the vehicle plans to primarily stay at and be on. But since our goal was to test worst case scenarios, we kept our balance and tuning at averages and still, the results were incredibly impressive. As to be expected, when zoomed in at 300 mm, we did experience a much higher incident of erratic movement or rogue vibration, but it only occurred sporadically, mostly when we hit an exceptionally rough area of terrain or had a hard horizon line where image paralaxing was more apparent. Even in these situations, the footage was in the acceptable range for commercial use. We were thoroughly impressed with the results. Tabb Firchau, Corey Koniniec, and Sam Nuttmann rip their way across the single track, chasing their subject in a RZR ATV, complete with a Freefly Systems MoVI XL / FlowCine Black Arm combo on the front. Secondary tests were more binary, such as whether the gimbal would shut itself off if we hit a bump hard enough, if taking a corner too tightly would cause roll to drift, and how responsive the system would be to the MoVI controller. We had no issues with any of these topics whatsoever. The biggest challenge with our off-road tests were in controlling the gimbal via the MoVI Controller precisely and accurately while the vehicle you are operating from is bouncing and vibrating violently. 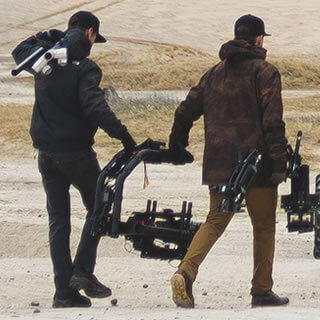 While this is not an issue stemmed from the MoVI XLsystem itself, it is certainly an issue to consider before you take on this type of shooting project. It is very easy to over-steer the gimbal or bump the wrong switch at a critical moment in your shot, so taking a little extra time to mount your controller well within the vehicle and ensuring you are as comfortable as possible as the operator is very important. Pulling focus accurately is especially challenging in this environment, as your monitor is constantly shaking about, so being able to pull focus accurately without use of a monitor is a nice skill to have for this. 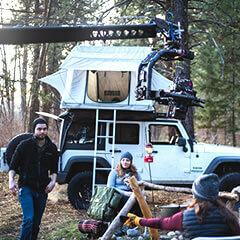 Potentially, you could operate the MoVI XL and pull focus away from the vehicle in a stationary spot near the action and get significantly better control and precision, but that can turn into a logistical nightmare depending on how much distance you plan to have the vehicles travel for your shot. But if your wireless systems have the range to cover your shoot area, this would absolutely be the way to go. Our next test was to see how well the MoVI XL would perform at high speeds. Since the smaller handheld gimbals such as the MoVI Pro can only withstand speeds of about 40 mph in a fully exposed environment before shutting off – hanging out of a sunroof window for example – we wanted to see at what speed the MoVI XL would stop functioning properly. We mounted our system to the back of an Audi SQ5 and headed to a small airport strip we had full access to. We began our tests by filming a vintage WW2 airplane piloted by the amazing Bruce Eskildsen take off and land at close proximity to our vehicle – an amazing experience to say the least! 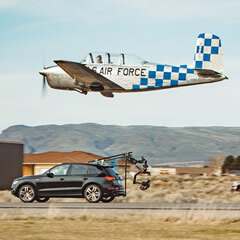 The airplane’s take-off and landing speed was around 50 mph and the MoVI XL did not even flinch at this speed. So we ditched the airplane test and simply took the Audi down the runway as fast as we could before running out of road and reached a speed of 110 mph. Again, not one issue with the MoVI XL’s performance, regardless of which direction the gimbal was facing. Unfortunately, we did not have the time to re-mount our gimbal system to the front of the vehicle to see how it performed with no wind protection from the car. This would be worth testing in the future, as well as finding a longer road where we can increase the speed to find the MoVI XL’s true break speed. For those of you interested in mounting the MoVI XL to the outside of a helicopter, similar to a Cineflex system, I would assume it would not work well without being enclosed in some sort of protective bubble or wind shearing cage. That would be a nice accessory to add to the MoVI XL kit in the future! 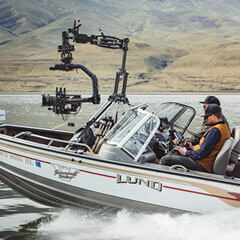 The primary learning we wanted to gain from mounting the MoVI XL on a boat was to see how it dealt with water chop and the rise and fall of the boat as it accelerated and decelerated. The water we were on was relatively smooth, so we did not get the full ocean chop experience that would have been ideal for our test, but from the chop we did hit, the FlowCine Black Arm / MoVI XLcombo did an excellent job of keeping the footage smooth, even while zoomed in at 300 mm on the lens. The combo also did a nice job of keeping the camera in position as the boat bow rose and fell due to rapid acceleration and deceleration. The FlowCine Black Arm does have a limited vertical travel range of approximately 1.5 feet so if your boat’s bow raises higher than that, you will likely see the horizon line shift a bit. But in our test, the bow raised just under this amount and it was amazing how the arm adjusted to keep the camera locked vertically in place, with no erratic bounce or noticeable translation. While our on-the-water boat tests did prove the MoVI XL / FlowCine Black Arm combo to be very effective on relatively smooth water conditions at any focal length, it would be very worthwhile to push this test further by getting it out on the ocean in some serious chop. Our tests would make me feel very comfortable lining up some wake boarding shoots or perhaps chasing some speed boats on a lake, but I would want to do further testing before taking it to the arctic circle to film the next season of “Deadliest Catch”. Let me start off by saying the Motion State team LOVES using cable cam systems. The shots are incredibly unique, repeatable, and you are able to access locations even a drone cannot get to – and with a very high level of safety. We mounted the MoVI XL to our Dactylcam Pro and throttled the system down about 200 feet of line at high speed – approximately 30 mph. These shots were so incredible to see being shot – you could hear gasps of “wow!” all over set. The Dactylcam Pro combined with the MoVI XL gimbal and a cinema zoom lens is such a powerhouse combo – you have to see it in action to believe it. The footage was buttery smooth and so much fun to shoot. If you’re looking to capture footage at a concert over a large crowd, chase a vehicle or subject through dense woods where a drone cannot go, or need highly repeatable tracking shots, definitely consider running this system – you will not be sorry. Considering all the extreme tests we put the MoVI XL through, we did not expect to have any issues with putting the MoVI XL on a jib arm and our assumption was correct. As with any motorized remote head on a jib, we were able to get beautiful, dynamic shots throughout our scene with very little effort. Since as with any well built jib arm, getting smooth shots is not all that difficult with a competent jib operator, there is not a lot to note here, except the MoVI XL performed consistently well with the same control you would have with any of the MoVI gimbals, with the addition of being able to use a large zoom lens on your camera. This section will not go into detail comparing the MoVI XL to other large motorized head systems, as we simply haven’t had the time or opportunity to fully test the many that exist on the market. Very generally speaking though, I want to bring up a few points that may help you make an informed decision before you spend some serious cash on one of these systems. This is truly where the MoVI XL stands alone in the marketplace. As of writing this article, the MoVI XL is expected to cost around $22,000. When you consider the cost of a comparable Shotover System with accessories is around $75,000, the MoVI XLis a massive value! Even with the addition of the FlowCine Black Arm, some extra batteries, and some grip accessories such as speed rail, car suction mounts, etc., you can expect to pay well under $40,000 for the whole kit. There is absolutely no other comparable system for a similar cost. It is important to note when comparing the costs of each system that you also take into account all the accessories that will be necessary to run each system properly in addition to the gimbal itself. So while the MoVI XL is significantly less expensive than the Shotover as mentioned above, the Shotover has a built in wireless video system and built in lens control, whereas you need to buy these systems in addition to the MoVI XL to make it ready to shoot. However, if you are like me and already running a MoVI Pro system, you will already own all these necessary accessories, so adding the MoVI XL to your arsenal is incrementally WAY less expensive than adding one of these other large format gimbal systems. I’ve had the opportunity to extensively use the Shotover G1 system (we own one), as well as play with several other high end systems such as the Cineflex Elite and the Oculus. While these systems do offer some nice additional features such as complete 360 degree roll and tilt, and the ability to mount under a helicopter or plane, the actual performance – their ability to stabilize a camera while in motion – does not seem to out-perform the MoVI XL. Here is where systems such as the Shotover, Cineflex and Oculus suffer – they require a great deal of knowledge to set up correctly and operate. Sure, if all you do is tech one of these systems, it probably becomes easy over time, but as a heavy MoVI user, I have not found these other systems to be highly intuitive as I would expect, despite them all doing more or less the same thing. What I found to be very compelling about the MoVI XL system is it is the exact same setup and operating system as all the other MoVI products. From balancing to tuning, if you can do it on the MoVI M5 or MoVI Pro, you can do it on the MoVI XL. Now setting up the vehicle mounts is a bit of a different story, but that would be the case with any system. You’ll need to do some research and training to ensure your amazing system doesn’t pop right off your car and onto the highway, but learning this is not all too difficult.